Saigontourist, one of Vietnam’s leading travel firms, last week held a ground breaking ceremony for the four-star Saigon-Ban Gioc Resort, in Dam Thuy Commune in the northern province of Cao Bang. The resort will cover an area of 31.15 hectares, including a 60-room hotel, 24 bungalows, a 200 seat restaurant, sports and entertainment complex, a conference area, a health spa and area for camping and outdoor activities. The first phase of construction is expected to complete by late 2013. The investment for the project is about VND170 billion (US$8 million). Mr. Tran Hung Viet, General Director of Saigontourist, said the resort will encompass the natural surroundings of the area with enough open spaces for the guests to enjoy the view. The building material used will be bamboo, wood, thatch and stone and will merge well with the local culture of the border area. The Saigon-Ban Gioc resort, the first of its kind in Cao Bang province, plays an important role in provincial tourism development, border defence and development. It is part of a cooperation program between Ho Chi Minh City and Cao Bang province. 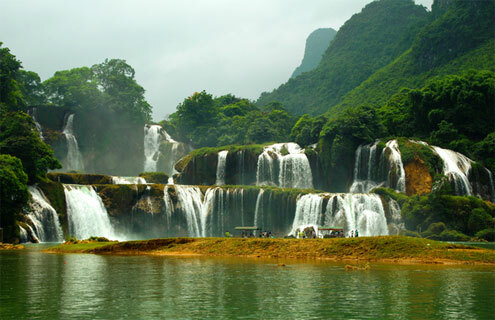 Ban Gioc Waterfall is located on the border between Vietnam and China. Vietnam owns half of the main waterfall and the waterfall branch. China owns the remaining half in the northern shore of Quay Son River. The area at the foot of the waterfall is for tourism development of the two countries.